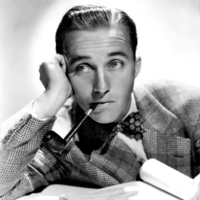 A multimedia star, from 1934 to 1954 Bing Crosby was a leader in record sales, radio ratings and motion picture grosses. Crosby's early career coincided with technical recording innovations; this allowed him to develop a laid-back, intimate singing style that influenced many of the popular male singers who followed him, including Perry Como,Frank Sinatra, and Dean Martin. Yank magazine recognized Crosby as the person who had done the most for American G.I. morale during World War II and, during his peak years, around 1948, polls declared him the "most admired man alive," ahead of Jackie Robinson and Pope Pius XII. Also in 1948, the Music Digest estimated that Crosby recordings filled more than half of the 80,000 weekly hours allocated to recorded radio music. Crosby won an Academy Award for Best Actor for his role as Father Chuck O'Malley in the 1944 motion picture Going My Way, and was nominated for his reprise of in The Bells of St. Mary's the next year, becoming the first of four actors to be nominated twice for playing the same character. In 1963, Crosby received the first Grammy Global Achievement Award. Crosby is one of the 22 people to have three stars on the Hollywood Walk of Fame.